The shortlist for the Hugo Awards was announced at the beginning of the month amid much controversy. SF Signal have an annotated shortlist showing the original nominations as well as the replacements that were made after nominations were declined or found ineligible. It also has links to where the nominations can legally be read for free–or at least a sample, in the case of the longer works. If you’re looking to get a handle on the controversy, Black Gate offers clear and concise explanation. Black Gate was nominated for Best Fanzine and one of its writers, Matthew David Surridge, for Best Fan Writer. Both have turned down the nominations. Surridge posted a detailed explanation regarding why he turned down the nomination. The drama over nominations hasn’t left Australia unaffected. Andromeda Spaceways Inflight Magazine was nominated for Best Semiprozine and only discovered after they’d accepted that this was due to their inclusion on the Sad Puppies slate. ASIM member Simon Petrie has offered his thoughts on the situation and in the comments he touches on the reasons why the publication hasn’t subsequently turned down the nomination. As a long-time subscriber to ASIM, I find it disappointing that this recognition has been tainted by the manner in which it has come about. The 2015 Stella Prize was awarded on Tuesday night to Emily Bitto for The Strays. The Stella Prize is a major literary award celebrating Australian women’s writing. The shortlist for the Norma K. Hemming Award has been announced. The Norma K Hemming Award is given annually by the Australian Science Fiction Foundation to mark excellence in the exploration of themes of race, gender, sexuality, class and disability in speculative fiction first published either in Australia or by an Australian citizen. With the 2014 Aurealis Awards presented earlier this month, a call has gone out seeking potential judges for 2015. I was sorely tempted to apply myself. Applications close at the end of the month, so you’d best hurry! Going back to the Hugos for a moment, Aidan Walsh takes a look at the nationality of Hugo winners. Spoilers: good luck if you’re not from the US or the UK. Relatedly, Israeli publisher Gili Bar-Hillel writes on how con programmers (and particularly WorldCon programmers) ghettoise panel presenters not from the US or the UK. Thanks to Kathleen Jennings for bringing this to my attention. Also via Kathleen, the Queensland Writers Centre is celebrating its 25th anniversary. To mark the occasion, they are crowdfunding for the inaugural Scholarships and Access Fund. The goal is to provide funding and travel support to writers from diverse backgrounds – to help them engage with QWC programs and access creative and professional development that might otherwise be unavailable for financial and/or geographic reasons. …The Scholarships and Access Fund aims to encourage voices less heard. Writers to benefit from the program include, for example: young writers; Aboriginal and Torres Strait Islander (ATSI) writers; writers who identify as living with a disability; female writers; lesbian, gay, bisexual, transsexual, transgender, intersexual and queer-identifying (LGBTTIQ) writers; writers from culturally and linguistically diverse (CALD) backgrounds; and writers from remote or regional Queensland. Speaking of crowdfunding, I mentioned the Defying Doomsday anthology from Twelfth Planet Press in my last Loose-leaf Links post. This anthology will contain apocalypse-survival stories featuring characters experiencing physical impairments, chronic illnesses, mental illnesses and/or neurodiversity. It has just been announced that a story by Seanan McGuire will be included. The anthology has until the end of the month to meet its crowdfunding goal. Strange Horizons takes a look at the gender and race balance of books reviewed and of reviewers across a range of SF review venues. Via Renay from Ladybusiness: Joe Sherry reviews the diversity in his 2014 reading material. The second half of the post makes some particularly good points on why he tracks the diversity in his reading. March was Women’s History Month. In case you missed Gillian Polack’s annual blog series, she has a handy round-up of all the guest posts. I always choose to hear the bad news first. So, in that vein, the Guardian reports that the earnings of the majority of authors in the UK do not meet minimum-wage level. If that hasn’t discouraged you (and I hope it hasn’t), there are some wonderful publishing opportunities coming up. Beginning 1 May, Fablecroft Publishing are having an open reading period for middle-grade and YA science fiction. Ticonderoga Publications are appalled at the Australian Government’s current refugee policy and are protesting by creating an anthology. People leave their homes behind, setting off, often risking everything, in search of a new start, a better life. We are looking for stories that emphasise what makes these people the same rather than focussing on where they are going, exploring the idea this is something that could happen to anyone and that seeking refuge in a new land can be a good thing, both for the migrant and for the place that becomes their new home. Stories that look at the inhumanity of indefinite detention of refugees, of allowing them to be stripped of their dignity and sanity. Stories that explore the potential benefits of allowing refugees to establish a new, safer life. If you’re thinking about submitting to either of these markets, perhaps consider naming your story something other than these 10 most common short story titles. I wish I could make all my potential clients read this. Dan Hanks interviews the wonderful Abigail Nathan of Bothersome Words on hiring a freelance editor. Speculative Fiction 2015 are looking for contributors to their non-fiction SFF anthology. If you run across a favourite review, blog, author, or article published on the internet in 2015, let them know! Speaking of which, the contributors to Speculative Fiction 2014 were announced this month. BookRiot have published the results of their 2014 reading habits survey. 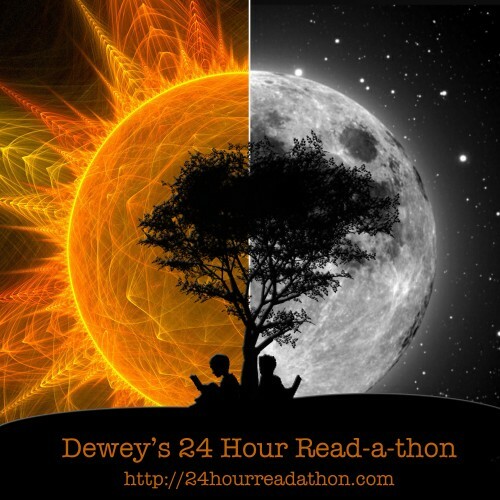 Which brings me to Dewey’s 24 Hour Read-a-thon! If my calculations are correct (and I make no promises on that front), this will be kicking off in Australia on Saturday, 25 April at 10pm AEST. If you need to tame your own Mt TBR (don’t we all?) or are looking to connect with a great community of book bloggers, it’s not too late to join! You can sign up, follow on Twitter, join the Goodreads group or any combination of the three. The read-a-thon website will be running warm-up posts containing great advice all the way up until the event. Don’t be intimidated by the name. You don’t have to go for the full 24 hours–I’ll be going to bed just as things get started. However, I will be participating all of Sunday. You can follow my progress on Twitter or wait for my report here next week. Please stop by, say hi and join me for a little reading of your own. If you’ve already signed up, I’d love you to leave me a comment about what you’ll be reading. Thanks for linking to my post. To be fair, most of my experiences were at World Fantasy, not WorldCon. I don’t want to tar all programmers with the same brush, I don’t think their job is easy. But if this were at the back of future programmers mind, maybe it would help, just to question some assumptions and heuristics. Apologies if I misrepresented your point of view. I found it quite an excellent post and I hope future programmers will take note of it.